Home » Recipes » Guilt free eggs benedict for brunch! Guilt free eggs benedict for brunch! 1. To prepare sauce, combine 1 egg, 2 tablespoons fat-free milk, 1 tablespoon dry white wine, 1 tablespoon fresh lemon juice, and 1 teaspoon chopped fresh thyme in a sauce pan. Cook at medium-high heat until thick (about 9 minutes), stirring constantly with a whisk. Remove from heat. Add butter, 1 piece at a time, stirring with a whisk until thoroughly incorporated. Keep warm. 2. Saute minced garlic and 1 teaspoon of butter; then add spinach, and cook until wilted (about 4 minutes). 3. Toast bagel/English muffin. Keep warm. 4. Add water to a large skillet, filling two-thirds full. Bring to a simmer. Add vinegar. Break each egg into a custard cup (or a soup ladle), and pour gently into pan. Cook 3 minutes or until desired degree of doneness. Remove eggs from pan using a slotted spoon. 5. 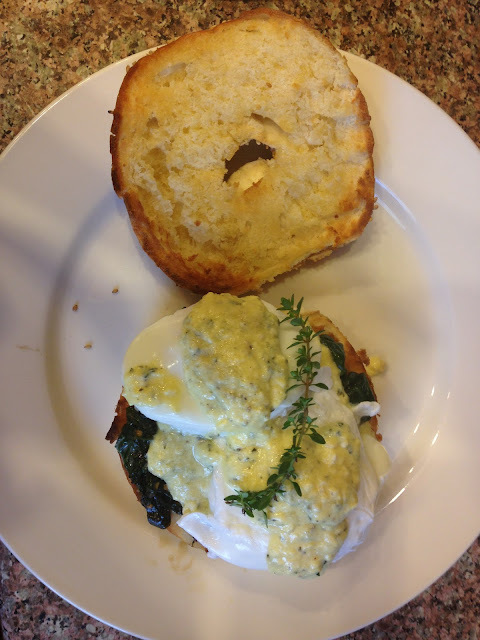 Top each bagel (English muffin) with half with spinach, 2 eggs and sabayon. Garnish with salt and pepper and a sprig of fresh thyme. Serve immediately. I hope you enjoy this guilt free delight at your next brunch gathering!